A solar regatta open to all middle schools, high schools, and universities from Fresno to the northern California border. SMUD provides solar panels and small stipends to each team. An annual contest sponsored by the Sacramento Municipal Utilities District that gives a team of students the opportunity to work on projects revolving around green energy, energy conservation, or sustainability for scholarships ranging from $250-$1000. At PG&E we offer internship opportunities for current college students, recent graduates, and MBA students across almost every area of business. Our internships are great opportunities to learn in real world situations and can be a precursor to employment opportunities with PG&E. Our college recruitment program focuses on opportunities that give you growth and build leadership skills that will last your entire career. The programs focus on the Accounting/Finance, Engineering and Information Technology disciplines and consist of formal rotations throughout different areas of the company. This allows participants to figure out a career path by providing experience in different departments. Participants are also provided a mentor to help support their development and introduce them to the industry. Gain valuable work experience and explore various business and engineering roles, while learning from experienced team members and learning about SMUD’s business and the energy industry. Open to high school juniors or seniors attending school in SMUD territory, the internship takes place over 6 weeks during the summer. Students will work 32 hours a week and must have 2.5 minimum GPA. The Solar Energy Systems Design, Estimation, and Sales certificate provides training in all aspects of solar photovoltaic (PV) system design, cost estimation, sales, and installation. Community colleges throughout California are implementing green/sustainability programs. Green Technology, a non-profit informational initiative, compiled a great list of community college green programs. Programs include the Building Performance Institute Certification program, Energy Efficiency Sales, Auditing, and Retrofitting, Solar Photovoltaic Design, Sales, and Installation Certificates, Environmental Controls Technology program. 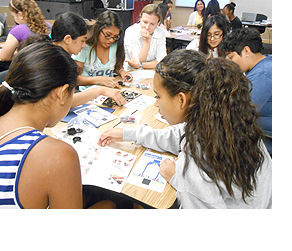 A partnership between PG&E and the California Department of Education, the New Energy Academy is a 3-year program for High School students grades 10-12 that focuses coursework and education on new and renewable energy education. Find more information and a list of participating schools, here. Sonoma State University offers a program in the Department of Environmental Studies and Planning that prepares students for professional careers in the energy field.